Don’t feel like cooking Thanksgiving dinner this year? That’s okay, check out these restaurants here in Birmingham that will be serving Thanksgiving dinner. Perry’s will be open 11 – 9 . on Thursday, November 22. Full dinner menu will be available as well as a special 3-course prix fixe menu for $49.95 which includes soup or salad, roasted turkey breast with traditional sides and pumpkin pie dessert. 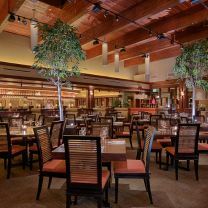 Seasons 52 will have a traditional Thanksgiving dinner with all the trimmings, like traditional herb stuffing and Yukon mashed potatoes. You can finish your experience with a Pumpkin Pie Mini Indulgence, or two. They are now accepting reservations. most popular personal sides, finished off with our dessert duo. Or enjoy a favorite from their full dinner menu.